When I heard that Aumbry was holding a ‘Gruffalo Lunch’ it was the perfect opportunity to take my 2 young Gruffalo loving children to one of my favourite restaurants. We arrived at the restaurant in Prestwich to find it packed full of small children crawling around the floor, the dining room decorated with Gruffalo pictures and paper cups everywhere. It resembled a 5 year olds birthday party rather than the fine-dining establishment that we’re used to. The staff were doing their best to entertain the kids with games of ‘Pin the tail on the Gruffalo’ and giving out stickers. Shortly afterwards there was a reading of the Gruffalo story. Then the reason we were there, the Gruffalo feast! First up was ‘Roasted Fox’, which I believe was chicken but was easily passible as fox given it’s dark red colour. They were tasty but slightly under seasoned for my liking. I’m sure this was intentional given the target audience. 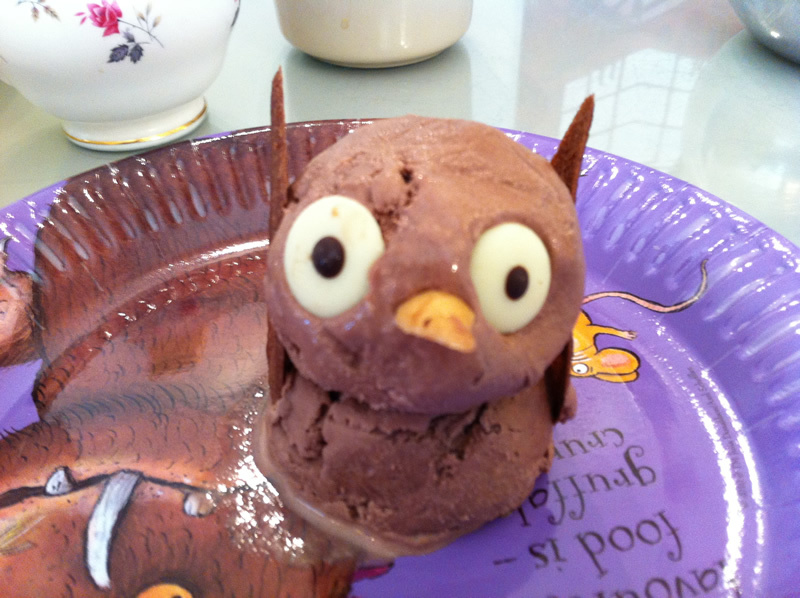 There were also sandwiches and crisps which is just as well considering the next 3 Gruffalo courses were desserts! The ‘Scrambled snake’ was delicious vanilla ice cream mixed together with jellied snake sweets. It looked good and tasted even better! ‘Owl Ice Cream’ next, by far the most impressive dish visually, an incredibly cute looking owl made of chocolate ice cream and wafers. It tasted every bit as good as it looked! Finally the most famous dish from the book ‘Gruffalo Crumble’. 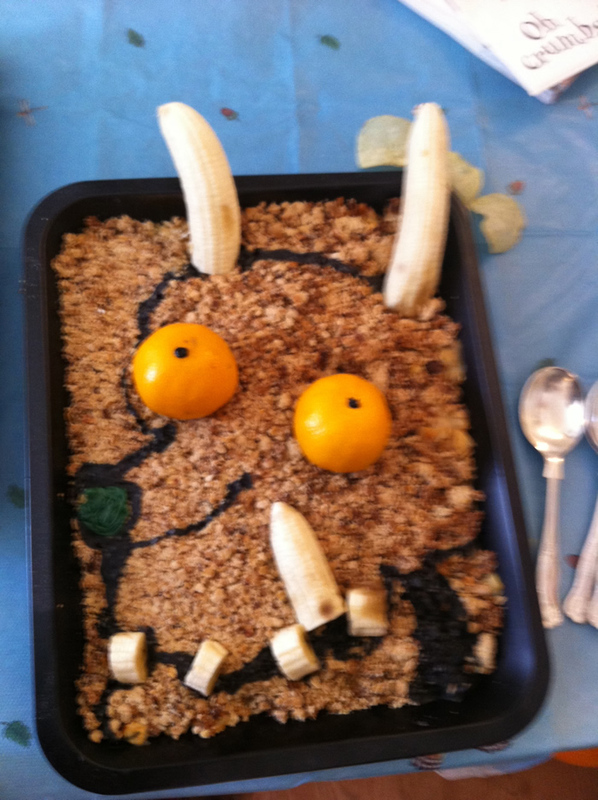 It turns out that Gruffalo taste a lot like apple which is great because who doesn’t love apple crumble? 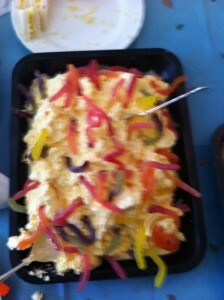 The dish was made to look like the Gruffalo with clever use of oranges & banana! Obviously it tasted fantastic, a little custard would have been nice though! Everybody had a fantastic time and it was for a great cause with all proceeds going to the Royal Manchester Children’s Hospital Charity. 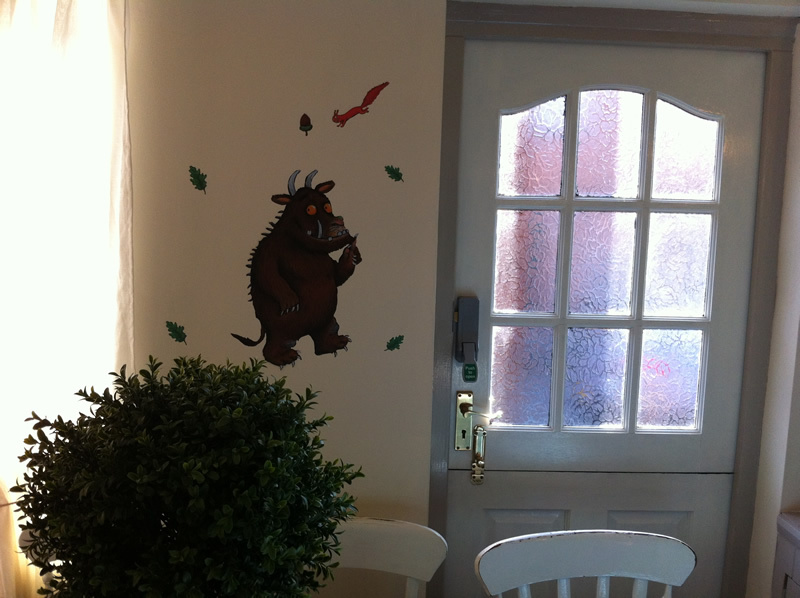 Thanks Aumbry, I hope you managed to get the Gruffalo stickers down before your fine-dining guests arrived in the evening!